On Thursday 16th October you can step back in time through food at The Geffrye Museum at the Shoreditch end of the Kingsland Road as Funthyme take you on an exploration of food from the 16th and 17th centuries. You get a 'historical drink' on arrival, and after that it's BYOB. "‘Food Through the Ages’ is a special evening combining historical food and interiors devised in partnership with Funthyme Dining and Events. Guests will step back in time to experience how previous generations dined set against the atmospheric backdrop of the museum. After exploring the period rooms from 1600 to the present day, guests will be served up a feast spanning the centuries. The menu will feature an historical drink on arrival, canapés and a three-course meal. Highlights include Fried Quail Egg and Bacon on Toast from the 16th century, and ‘Salmagundi’ - an exotic 17th-century salad of carved beetroot, cold chicken, anchovies, eggs, pearl onions, green beans, grapes, leaves and flowers. Kate Colquhoun, food historian and author of 'Taste - The Story of Britain through its Cooking' will introduce each course with intriguing stories and fascinating snippets." Tickets are £50 from here. 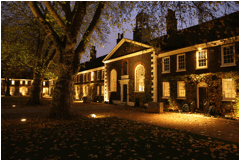 or buy by calling on 0207 739 9893 or email bookings@geffrye-museum.org.uk BYOB to accompany the meal.